Without an immediate about turn in the stock market, we will get an "All Market Sell Signal" on Friday for the first time in over a year. Stocks are now trading at their second highest ever reading based on Warren Buffet's favourite valuation tool. Stock market volatility has picked up recently, and in the short-term, equities are oversold and should bounce. In fact, there have been six other times the Vix Index has jumped 60% or more in three days. Every time, stocks rallied over the next two days. In four of the six times, the rally marked the end of the decline. However, in the other two instances, stocks rallied for 5-7 days and then rolled over to new lows. Our best advice is to continue to follow our Active Asset Allocator Model which is defensively positioned 20% equities / 30% 5+ year Eurozone government bonds / 30% absolute return bonds. / 20% gold. This is a big week for the stock market. My Technical Trend Indicator (TTI) will deliver its first "All Market Sell Signal" in well over a year this Friday unless stocks do an immediate about-turn. Risks are running high as equities enter their sixth year of rising prices without a meaningful correction (we typically experience a 20% correction in stocks every 3.8 years on average). Investors must now contend with an overvalued stock market, overly bullish investor sentiment, the end of the Federal Reserve's latest round of money printing (QE3), which has provided $1 trillion of support to the capital markets this past year and a technical trend change in the market. We have come a long way since the 2008/9 stock market lows and that is now reflected in equity market valuations. A Warren Buffet favourite valuation tool: US corporate equities are now valued at 127% of US nominal GDP, the second highest reading in history. The S&P 500 has traded for 475 consecutive trading days above its 200 day moving average - the longest stretch in history - but closed below key support on Friday. 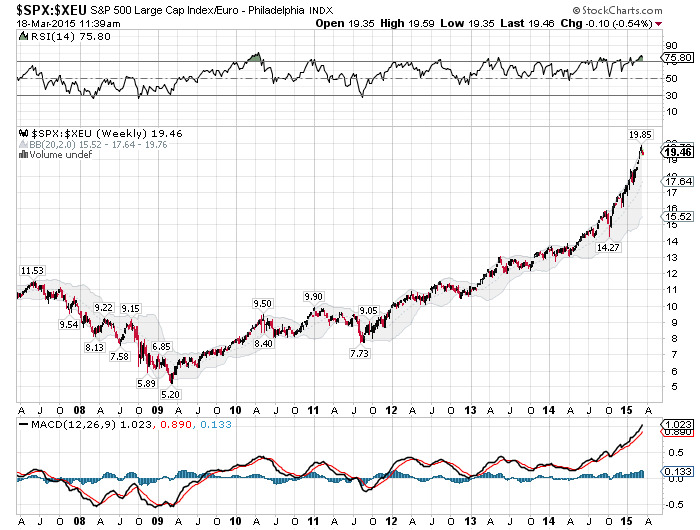 While the most popular stock market indices (Dow Jones Industrials, S&P 500 and Nasdaq) are holding up reasonably well so far this year, the smaller cap indices in the US and many key European stock markets have been trading much weaker recently. The character of the market is changing and this can be seen in the spike in volatility measured by the Vix Index (below) that has coincided with the recent decline in the stock market. In the short-term, stocks are oversold and should bounce from here. In fact, there have been six other times the Vix Index has jumped 60% or more in three days (19/10/1987, 13/10/1989, 8/6/1990, 27/2/2007, 6/5/2010 and 8/8/2011). Every time, stocks rallied over the next two days. In four of the six times, the rally marked the end of the decline. However, in the other two instances, stocks rallied for 5-7 days and then rolled over to new lows. If we get a relief rally that fails over the next week, watch out below. We remain defensively positioned in our Active Asset Allocator Model. High yield bonds are also signalling renewed stress in the credit markets for the first time in over three years and equity investors definitely don't like it when junk bonds are plunging to new lows as they are today. So, what's an investor to do? 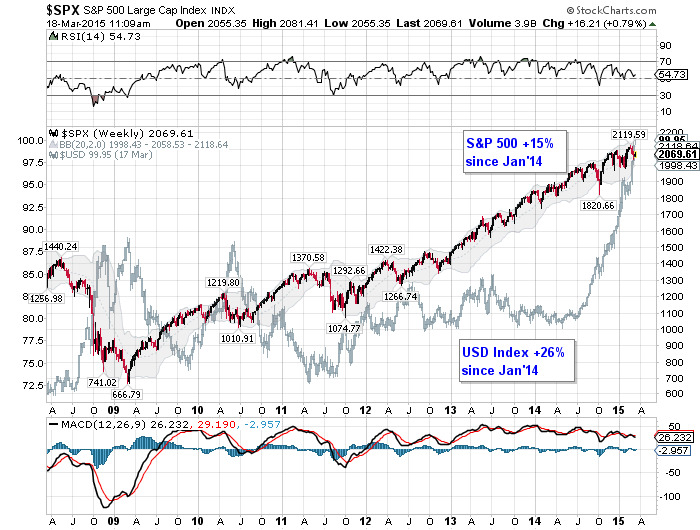 The technical trend indicator has navigated the market turns like a professional. Our Active Asset Allocator investment strategy has switched to defensive mode ahead of every significant stock market decline and reverted to bullish mode to capture each medium-term rising trend since inception. Note: the Active Asset Allocation Strategy switched to defensive mode in June 2013 due to our concern over the ageing equity bull market and has since benefited from an overweight position in bonds. For more information on our analysis, please get in touch. You can reach Brian Delaney at brian.delaney@secureinvest.ie or at 086 821 5911. 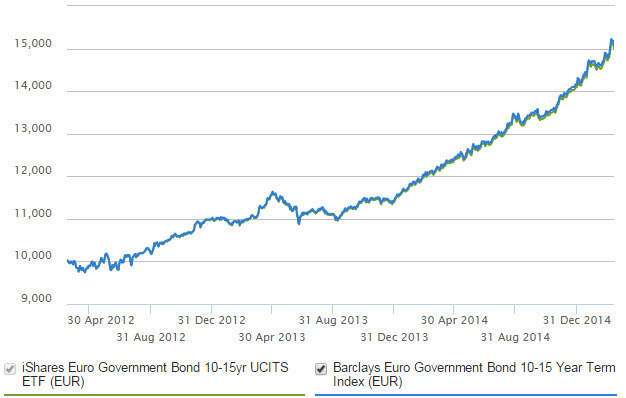 US and EU government bond yields are turning lower again but have yet to make new all time lows. Even if they do, there is limited room for yields to fall. We will likely stay in this low yielding environment for quite some time, particularly if equity market volatility picks up over the next 12 months. Only a bout of inflation or a currency crisis will cause yields to spike. High yield bonds also look unattractive for yield seeking investors, particularly following their recent break lower. So, for investors in search of safety in a low yielding fixed income world, we are left with short duration government debt, emerging market debt and/or absolute return bond strategies. We have an allocation to two of these strategies currently in our Active Asset Allocator model and are happy to discuss in more detail. For more information on our bond market analysis, please contact Brian Delaney at 086 821 5911 or by email at brian.delaney@secureinvest.ie. Commodities as an asset class remain totally out of favour. The CRB Index, when measured against the S&P 500, has returned to 15 year lows, quite unbelievable when one considers the trillions of newly printed notes circulating in the system. We could start to see a rotation into this asset class if equities start to turn lower. Gold continues to hold up quite well here, particularly gold priced in euros, which is +11% YTD. Despite gold's resilience to hold above $1,200, I am not hugely excited about the triple test of $1,180 by USD gold in recent months. These support zones tend to become targets for active traders and there are probably plenty of stops placed just under those levels. We could head back below $1,180 on the next decline for gold. That said, this bear market in gold is getting long in the tooth. 2015 could be the year for precious metals to shine once again as one of the remaining true safe haven stores of value in a fiat currency world. In the meantime, continued patience is required. For more information on our gold market analysis, please contact Brian Delaney at 086 821 5911 or by email at brian.delaney@secureinvest.ie.